Most experienced Linux users are familiar with Secure Shell (SSH), with some being regular users. The protocol supports encrypted connections with remote devices via TCP/IP according to the client-server principle. Typically, you connect to servers that do not have a graphical user interface (GUI). 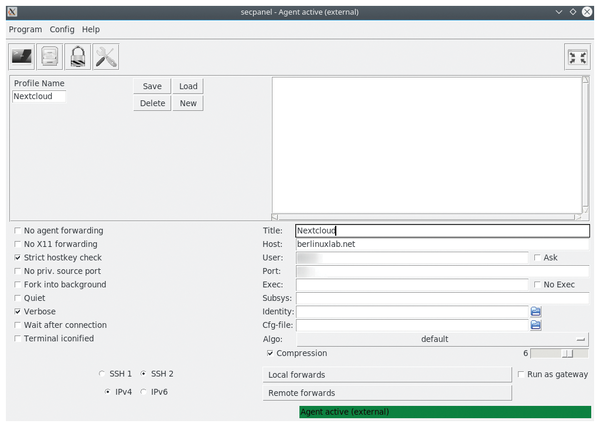 However, with the appropriate bandwidth, you can manage tools with a GUI using X forwarding. Most Windows users are familiar with the PuTTY open source terminal emulator as an interface for SSH, whereas Linux users usually interface with SSH on the command line. Although PuTTY is also available for Linux, SecPanel , which has been under development for many years, has gained better acceptance in the Linux world (Figure 1). Figure 1: Although SecPanel offers more functions than EasySSH, it is also more complicated in daily use. SecPanel stores frequently used connections in profiles and creates them at the push of a button. If you are looking for a less complex alternative, EasySSH  is worth a look. When installing EasySSH, it is important to make sure that you download the correct tool (see the box "Same Names"). EasySSH is an easy-to-use tool that acts as an SSH connection manager. It was written by the Elementary OS distribution team but is also suitable for other distributions. Do not confuse the tool with the easyssh script, which implements functions of the SSH protocol in the Go programming language. Even if you prefer to work at the command line, it makes sense to automate repetitive steps, such as establishing an SSH connection. The more servers you contact, the more useful you will find an easy-to-use GUI tool that remembers each host's data. EasySSH, which has only been under development for a few months, currently has a major limitation: To reduce the act of opening an SSH connection to a single mouse click, the program saves the access credentials, including the password, in plaintext in the local configuration file. Consequently, it is only suitable for computers that are in a trusted environment or that have an encrypted disk. However, the developer has promised that the configuration file will soon be encrypted and protected by a master password. Once security can be guaranteed, there is no drawback to using this program. Since EasySSH is not found in the package sources of major distributions at this time, you must install it manually. For easier installation, you can use a Flatpak (current version 1.3.4) available on Flathub , the Flatpak app store. Additionally, Arch Linux users can download EasySSH from the AUR. To install from Flathub, go to the Flatpak Quick Setup  and follow the instructions for your distribution. Next, reboot your system. 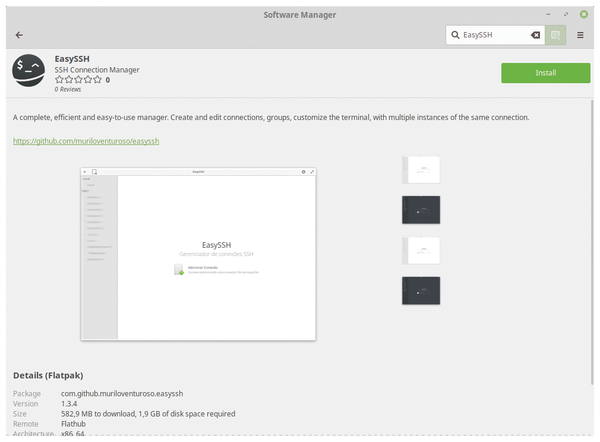 Gnome users should then be able to install the program with Gnome Software (Figure 2); KDE supports the integration of Flatpak applications as of Plasma 5.13 in the Discover graphical package manager. Figure 2: Flathub is the central app store for Flatpaks. First configure access to this parallel ecosystem and then install EasySSH. command as a normal user. The system first imports the required run-time environments and then EasySSH itself. The run times offer benefits with later Flatpak installations.